The Rhapsody of the Seas is the cruise ship for everyone, whether you are on board to get out on the sea and relax or seeking adventure. 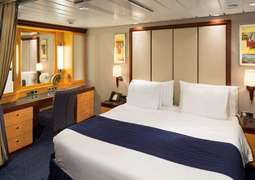 The Rhapsody of the Seas is the perfect place for you to find your ideal cruise experience, as you cruise to Europe, the Caribbean or make Transatlantic journeys. The ‘Vitality Spa’ or the Adult-only solarium are the perfect place to unwind and forget all your stress. For younger passengers the ‘Royal Babies’ and ‘Royal Tots’ will provide all the fun and games they need. If you are the adventurous type, you can try out the rock-climbing wall on board or just try your hand at some games in the video game arcade. The dining on board the Rhapsody of the Seas is what you would expect from a Royal Caribbean cruise, varied, tasty and available the way you want it. The ‘Chef’s Table’ is an intimate dining experience serving fine food. You will find high quality steak in ‘Chops Grille’, a la carte sushi in ‘Izumi’ and lots more available. As the sun goes down you can try out some cocktails in the ‘R Bar’ complete with iconic 1960’s furnishings and enjoy the jaw-dropping ‘Centrum’ aerial show high above your head, ensuring you enjoy every part of your day on board the Rhapsody of the Seas. 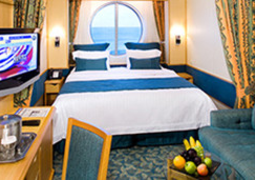 On board the Rhapsody of the Seas you have the choice between different outer, inner and balcony cabins and suites. No matter which you choose, you’re sure to feel your best in your home on the high seas. Two sunny and spacious restaurants on board make sure that your palate is well-pampered. There are also many other themed bars and lounges awaiting your visit. Boredom is the only thing you won’t find on board the Rhapsody of the Seas. Test your luck in the “Casino Royal” or explore the shops while taking a stroll through the light-flooded Atrium. No matter whether you’d rather work out or relax to the core—you have countless opportunities to do both on board. Pay a visit to the modern fitness centre and Day Spa, or climb to lofty new heights on the climbing wall. The Rhapsody of the Seas has a bright, sunny Atrium filled with boutiques and cafés. Here you can go shopping or simply sit in a café to relax and observe the hustle and bustle on deck. 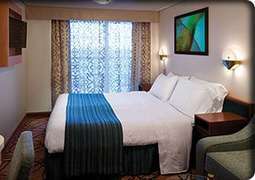 The Rhapsody has one conference room and six other seminar rooms, all of which are well-equipped. From the snow-capped mountain coasts of Alaska to skyline views of Sydney, Australia, Rhapsody of the Seas® delivers an unforgettable cruise experience, no matter the hemisphere. Get out to sea and relax away the stress of life on land – at the VitalitySM Spa or glass-canopied Solarium adults-only pool. This is a ship built for adventure, too, with rock climbing, the Casino Royale®, and entertainment including shows, live music, plus bars and lounges that never have a cover. 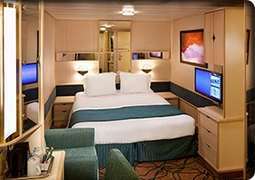 Now there’s even more to love on the newly revitalized Rhapsody of the Seas®, featuring our fleet’s newest offerings.